I’m embarrassingly late with the last month-moon post, but it has to be written to complete our full year of month-moons! I highly recommend taking these monthly get-aways, whether they be a short day-trip or an extended weekend, just getting out of the routine can do a relationship good. For our finale – our October-Moon – and to celebrate our one -year anniversary, we decided to go back to where the honeymoon began. Carmel. 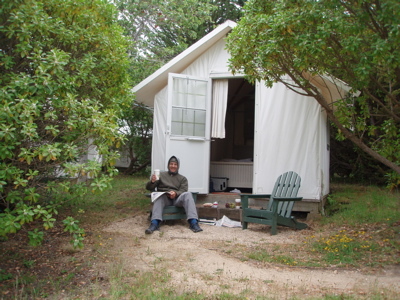 We stayed at the same hotel where we stayed for the first two nights of our honeymoon – The Tickle Pink Inn – nestled on a cliff in the Carmel Highlands. We lucked out with beautiful weather once again and enjoyed a walk on our favorite beach and eating the melt-in-your-mouth gnocchi from Casanova. The view from our room. Yes, I asked if we could just move in. 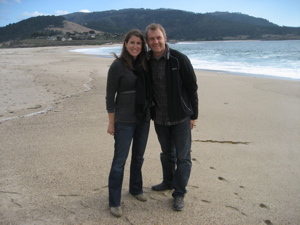 Our favorite beach that we discovered last year! What we’d bring with us next time: Absolutely nothing. It was a perfect finale to our month-moon getaways. Back in January, we dreamt of a September-Moon in Spain. We bought a guidebook, interviewed other Spain travelers, and mapped out our route. But, things don’t always happen as planned. 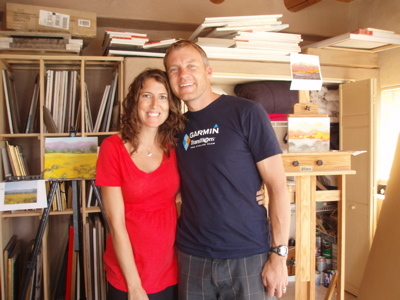 Funds and lack of time off caused us to re-route and simplify. 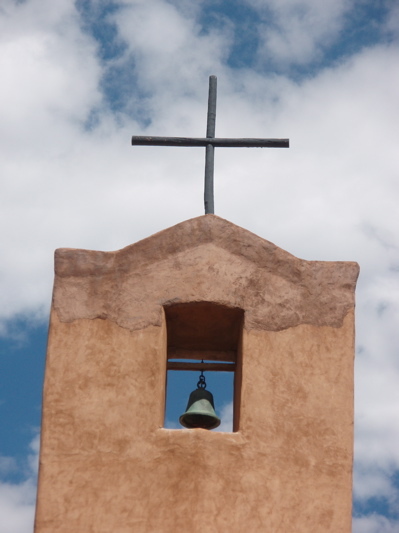 So, we landed on Taos, NM – we heard great things about it and that it was also settled by the Spanish (the next best thing to being in Spain, right?). You could also call this “Honeymoon” trip our Baby-Moon… but that would imply that we’re not going to be out and about and traveling until February. No way, I say. I have a stubborn travel gene. Have bump. Will travel. We took the “High Road” rather than highway from Albuquerque to Taos so we could enjoy the scenic route. 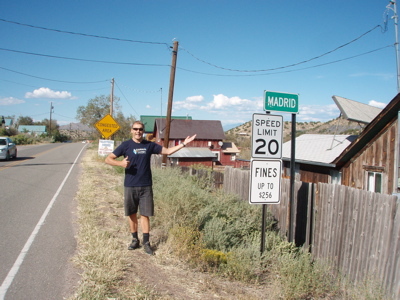 As we drove our sporty compact rental, we came across the small town of Madrid. Maybe we were in Spain after all. 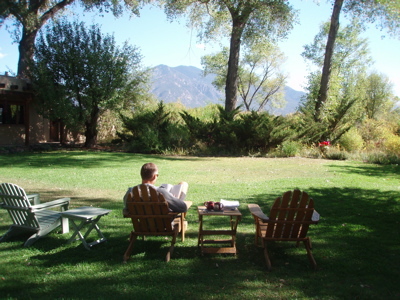 We followed Sunset Magazine’s advice and stayed at the Hacienda del Sol – a B&B with an amazing view of Taos Mountain and the a spot where Georgie O’Keefe used to stay as well. We claimed to be aspiring artists in residence. 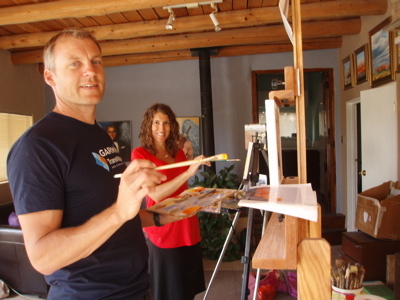 We painted local scenes from Taos, and found out from the artist that the photo Carl was painting from was actually taken from the Wal-Mart parking lot, and the adobe building the background was actually an Applebees. Nice. But she assured us that when you’re an artist, you can “play God” and edit those kind of details out. Carl avoided the neon apple logo. 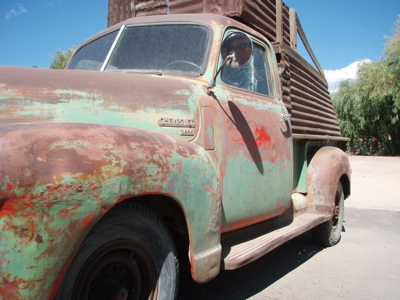 On one of our days, we took a long drive to the town of Abiquiu (if you can call it town… as it only had a convenience store). Georgia O’Keefe lived there and was inspired by the beauty of the surroundings with the backdrop of red mountains and sage. 30 minutes past this “town” we drove 13 miles down a dirt road to a Benedictine monastery – Christ in the Desert. Carl contemplated becoming a monk. I reminded him that he married me, and that lifestyle was out of the question. 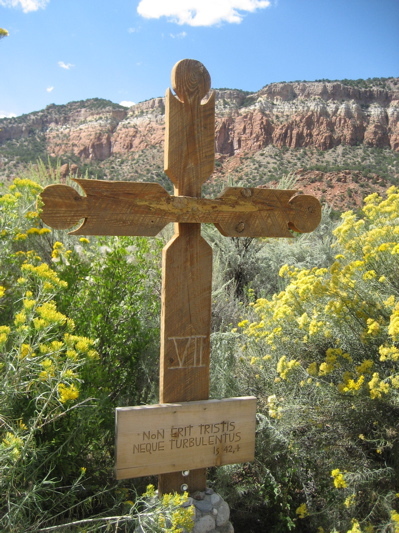 We pondered this as we walked past the beautifully carved crosses that led to the main chapel. If you ever want a place to get away from it all and experience absolute silence… this is the place to go. People take silent retreats there all the time. And, Benedictine monks are known for their hospitality. We even met Brother Francis who confirmed this during our visit. 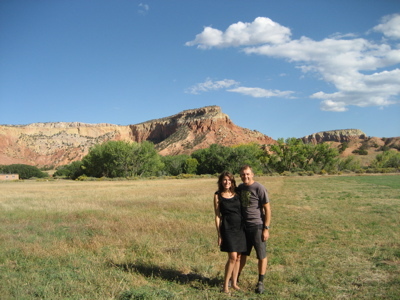 Afterwards, we walked around Ghost Ranch where Georgia O’Keefe lived and painted… but more importantly(?) where City Slickers was filmed. Of course that’s the movie we watched that night back at the B&B. Other highlights from our trip? Yummy New Mexican food – enjoyed both the red and green chiles. Hiking Taos Mountain to a glacier lake. Oh, and the dumbest thing we did? 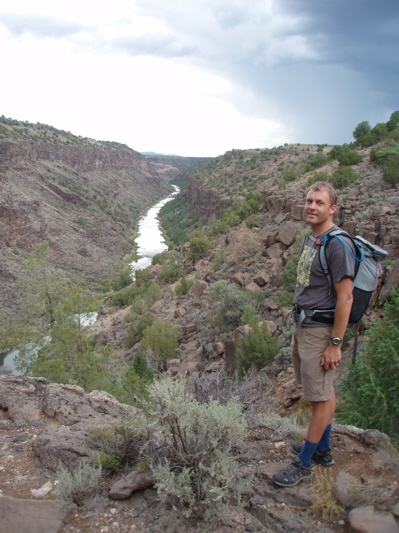 We hiked during a break in a lightning and thunderstorm to the bottom of a gorge to some natural hot springs next to the Rio Grande. 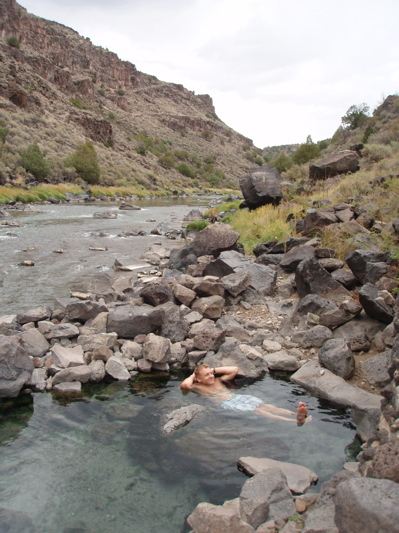 We had about 10 minutes in the hot springs before the rain and thunder started up again. I’ve never hiked so fast in my life. But I must say, watching a thunderstorm with a completely unobstructed view overlooking the desert is a quite a site to see. It also provided a wonderful sunset for our last night in Taos. Thank goodness our trusty rental got us out of many sticky situations! Rating: 2 enthusiastic thumbs up. 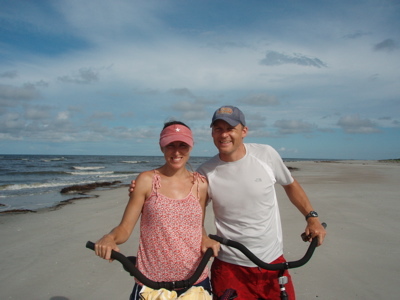 For our August-Moon, I took Carl to one of my favorite vacation spots – Hilton Head Island, SC. I’ve been going there since I was 7-years-old, so there have been an accumulation of memories and traditions. I introduced him to all of my favorite things – hushpuppies, riding bikes on the beach, relaxing under a ceiling fan in the screened-in porch, southern rainstorms, admiring the hanging moss from the trees, and warm nights. And to his dismay, I continue to introduce him to my favorite things about The Sound of Music. I mean, what else are you supposed to do when you find a perfectly good gazebo? Yes, I married a good sport! We were actually there with my family, celebrating my Dad’s 70th, my birthday, plus Matt and Olivia’s birthday, and my parents’ anniversary. We’re very efficient with our celebrations. 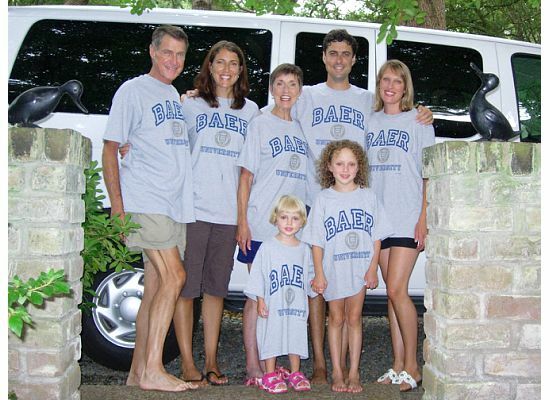 When we were last in Hilton Head four years ago, my parents enrolled us in Baer University. But this time around, we were at Camp Baer. 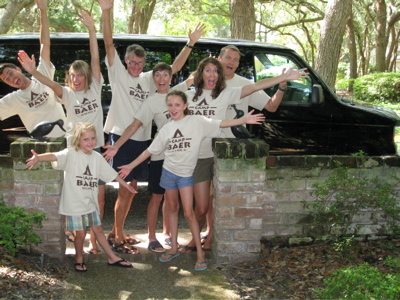 Camp Baer pretty much rocked. The big agenda each day was to head to the beach. After collecting shells, boogie boarding, playing bocce ball on the sand, and getting caught up on important reading material like People Magazine, we’d head to the pool for a dip. 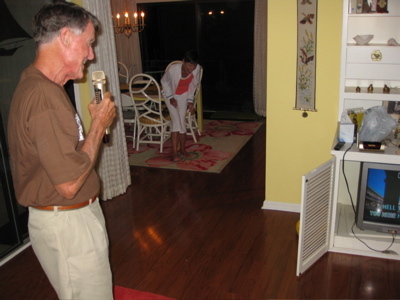 During the heat of the day, we’d pile into “Papa’s Bus” to go back to the house for some A/C, and brush up on our karaoke skills. 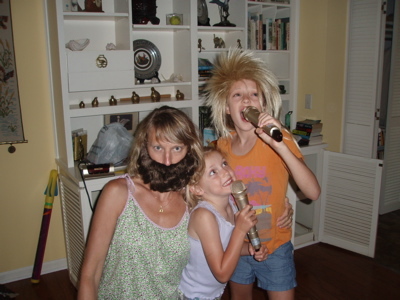 And this is just another reason why I love my family. As Camp Baer was winding down to a close, we took a day trip to Savannah just to make sure Carl really got a good experience of humidity in the middle of August and some true Southern BBQ. I don’t know if this counts for variety since water was still involved, but for our July “honeymoon” we didn’t go to the coast. We went to Tahoe. 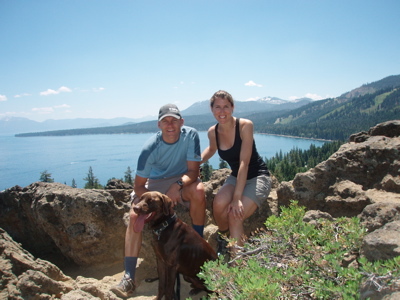 The “Keep Tahoe Blue” bumper sticker on the back of Carl’s truck reminds us of this glorious spot on a daily basis (except that Carl decided to get the one in Spanish – Mantega Tahoe Azul!). We stayed in Tahoma for a couple of days before joining the annual Hekkert camping trip in South Lake Tahoe/Fallen Leaf Lake. 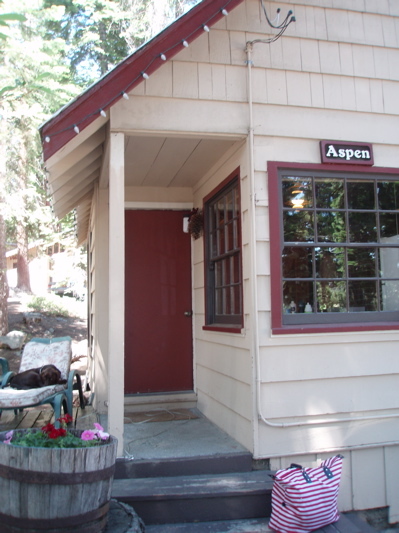 We upgraded ourselves again from the tent-experience, and stayed in a cozy loft-cabin at Tahoma Lodge… the only pet-friendly place we could find. Yes, we took Sutter on one of our month-moon get-aways. I was a bit nervous leading up to the trip, unsure of what our crazy lab would do… but he defied the odds and was a complete champ! As you can see, he made himself quite cozy anywhere he went. Sutter informed us again that he thinks he’s human and has the right to lounge anywhere he pleases. Hmm. Dog Whisperer… what would you do? We hiked, we biked, we swam… and Carl ran while I coached him to run faster while I rode behind him on my Oma-bike (Carl’s precious name for my awesome, cushy bike, complete with a kick-stand). And, Sutter was there for every adventure. The big news was that we taught Sutter how to swim. Wait.. don’t all labs just know? That’s what we thought, but Sutter could not be convinced to go any deeper than his chest-level… even with all of our prodding and pulling and negotiations. 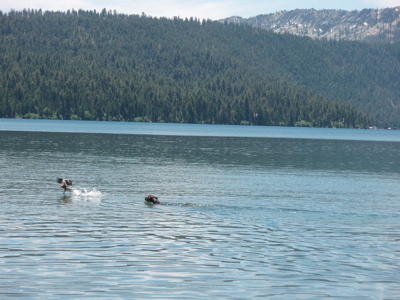 Carl eventually had to carry him into the lake and Sutter would swim with all of his terrified might back to me on the shore. He wanted nothing to do with the water, until he spotted a duck and his natural instincts finally kicked in. Before we knew it, he was 50 yards in the middle of the lake swimming after the duck! We were like proud parents watching him from the sidelines as people cheered him on from the shore, knowing that he’d never actually get the bird (who was completely toying with him). Still… our hearts were happy and we were proud of our water-dog. 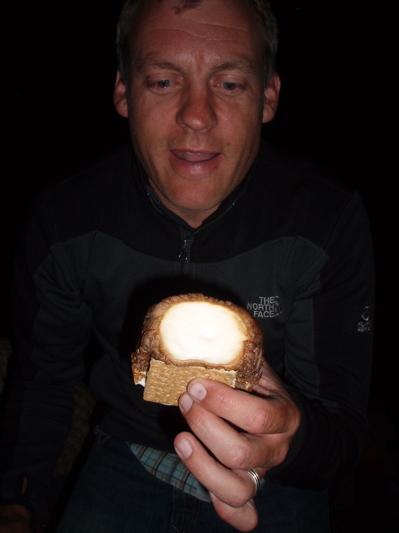 We ended the Tahoe trip with some ah-mazing monster s’mores. Hershey’s just needs to come out with a monster-size chocolate bar to complete this dessert masterpiece. 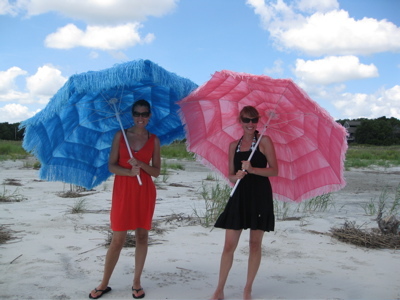 What we’d bring with us next time: Our sleeping bags, pillows and beach chairs. Thank goodness Carl’s parents left after us so they could grab these essentials for the real camping part of the trip! In June, we made our way to the coast again. 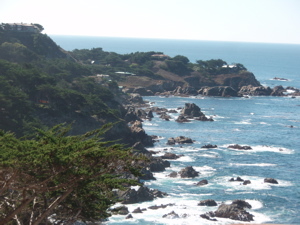 I know, I know… we just don’t tire of the California coast-line. Now let me tell you friends, this is the way to camp. Fancy tent-cabins with a real bed, electric blankets, Adirondack chairs with unobstructed views of nature, and super clean bathrooms. 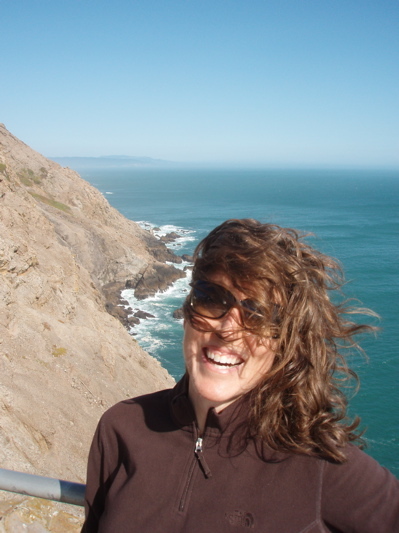 Aahh… welcome to Costanoa. I’m all for roughing it, but let’s be honest, wouldn’t you rather have a nice comfy bed to sleep in? 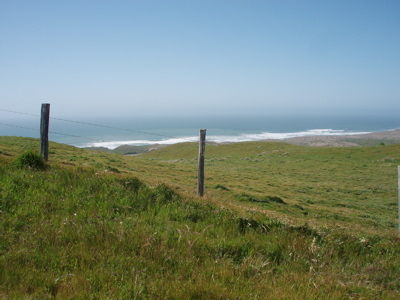 Costanoa is 25 miles north of Santa Cruz and 25 miles south of Half Moon Bay. It was an easy hour drive for us, but it felt like we had truly escaped suburbia strip-malls. Yeah! It was truly freezing on our first day (thanks to the June gloom fog), so we couldn’t pass up a hot cup of coffee to go from the restaurant near the lodge at Costanoa. 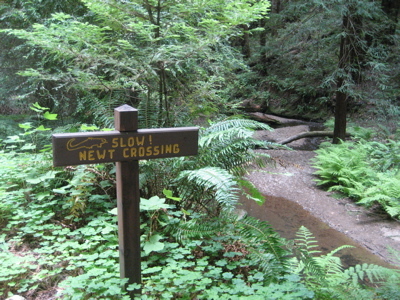 Later on in the day, I learned all about newts and became familiar with my less-than-favorite creature… the banana slug. 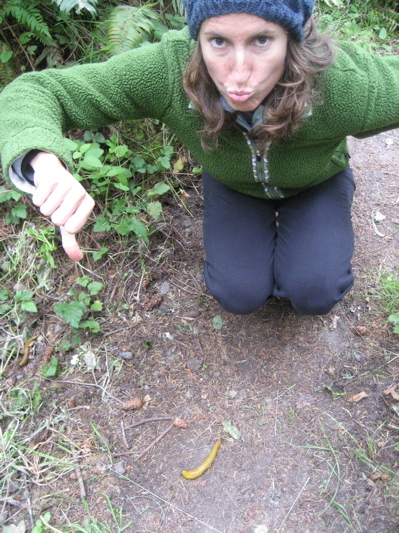 Seeing the slugs brought back all sorts of memories about growing up on Bainbridge Island, Washington. I know this is terrible, but as a kid, Matt and I devised all kinds of slug torture mechanisms… including fireworks. I won’t go any further, but if you’ve ever slipped after stepping on a slug in bare-feet, you will have an equal dislike for these slimy things. On our last day, the sun appeared and we decided to check out the local farms and go berry-picking… yet another past-time growing up in Washington. 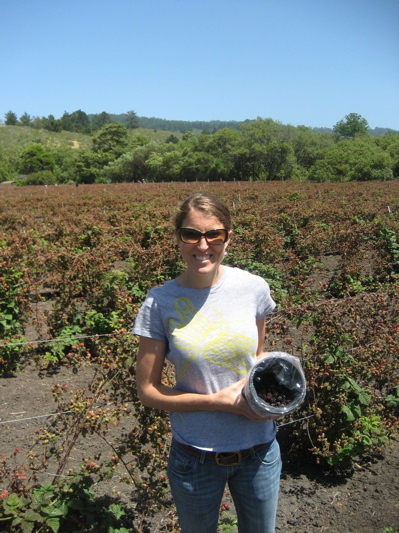 If I only knew now, how much a basket of blackberries cost, I would have savored each one I picked growing up. Oh well. This farm boasted the famous ollallaberries… a hybrid of sorts. Good times. 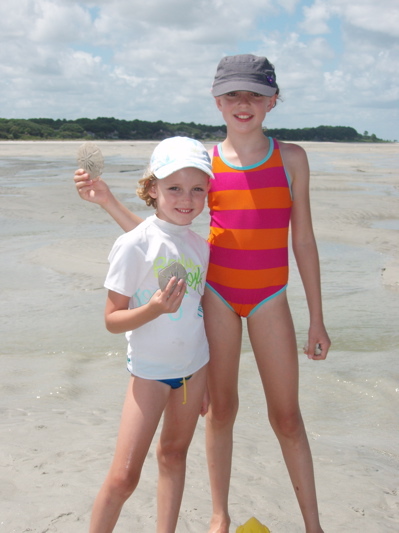 What we’d bring with us next time: Friends to camp with, s’mores supplies, and some salt for the sluggies (sorry). Our May-Moon took us to Sacramento where we stayed with friends over the weekend so we could catch the first stage of the Tour of California. 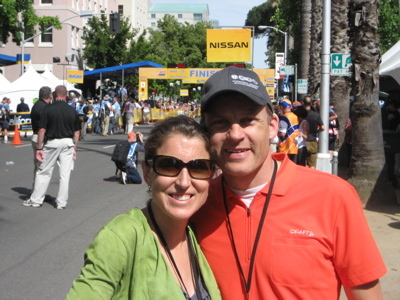 We were able to sneak in as VIPs to the Dutch RaboBank tent right at the finish line in front of the capitol building. Carl, of course, was wearing his signature orange. Carl also competed in a few races during the month of May, including a race in Los Gatos. 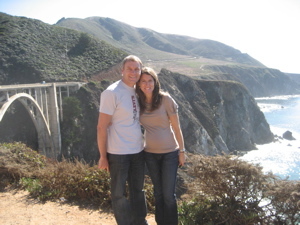 It was so great to be back in our favorite town in the South Bay…we hadn’t been back since our wedding weekend. I told Carl to make sure to look intense, so he stuck out his tongue for added effect. Carl’s parents, my godparents – Steve & Margie, and Sutter joined in on the side-lines. Go Carl! What we’d bring with us next time: A portable water dish for Sutter. It was hot! I’m seeing a theme in our “Month-Moon” get-aways. They all involve the ocean. I guess one of these days we’ll need to take a trip to Bakersfield. Or, maybe not. For our April-Moon (yes, I understand that it’s almost June….sigh), we took a Sunday drive from Healdsburg to Pt. Reyes Lighthouse. Have you ever looked at Highway 1 on a map, and estimated the driving time not taking into account that the map doesn’t show all the twists, turns, and 15-mile-an-hour tight bends? Well, if you haven’t made it out to Pt. Reyes Lighthouse, just know that it will feel like you are driving out to the end of the world. It’s a beautiful drive, but you have to suppress the 5-year-old inside of you that keeps wanting to ask, “Are we there yet?” I seriously felt like we were driving to the most western point of California, or the U.S. for the matter. And then when we were within a mile, we got stopped by a forest ranger. This isn’t a nice part of the story, but a motorcyclist didn’t judge one of those tight turns and got stuck in a barbed wire fence and was being air-lifted out. So we sat in the truck, taking in the view of the picture above, and decided to just have our picnic in the car. Once we got to the parking lot and hiked the mile to the stairs to descend to the lighthouse, people were telling us to turn around. The lighthouse had just closed. Recall scene from National Lampoon’s Vacation at Wally World. Closed you say? Right. Carl and I leaped down the stairs, not paying attention to the rule-followers climbing back up the stairs. The forest ranger actually just laughed at us as we skipped and sprinted to touch the lighthouse first. Hey… it was a long drive and ordeal to get there. I had to at least touch the lighthouse. 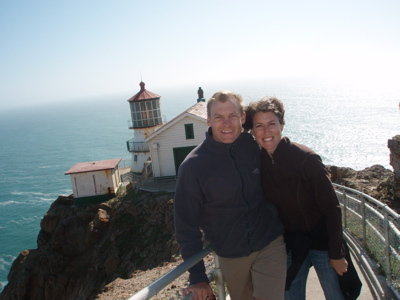 This was Carl’s second time to the lighthouse, but the first time he actually got to see it. His first trip was completely surrounded by fog and he could barely see 5 feet in front of him. We lucked out with clear skies, blooming ice plant covering the hillsides, and even some whale sightings. What we’d bring with us next time: A rubberband for my hair.